Last year, YouTube launched a Captions and Subtitles feature. In addition to launching a new playlist for captioned Developer Videos, we're also kicking off an Open Source project to host caption files that anyone can reuse under the terms of the Creative Commons 3.0 BY license. We're hoping that developers will come up with interesting uses for caption data, once it's in the public domain. You can use transcripts as a corpus for training speech-to-text algorithms or testing applications that read and write caption files. Or, combine timepoint data with YouTube's URL support to jump to a specific point in a video. Caption tracks make YouTube videos accessible to a wider audience. For example, try a search on [RESTful protocol YouTube] and you'll find search results from the captions on Joe Gregorio's recent talk. While we're delighted that Kevin Marks' captioned English accent can be more easily understood by Americans, we've also translated the caption files and provided tracks in multiple languages for a few of our captioned videos. 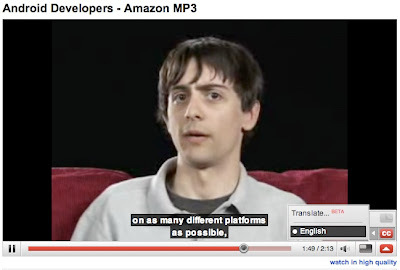 For all other videos, YouTube can perform Auto-Translate on caption text using Google Translate technology. To learn more about YouTube caption file formats, take a look at the YouTube Help Center. If you're interested in contributing caption files for videos on Google channels, or making translations available, please consider joining the project. We hope you'll find these additions useful. Happy reading!